Recently, I have been hearing people say that making mistakes is a good thing and that we must make mistakes. For example, this week, I came across a Dutch booklet which argues that we must make mistakes. The argument goes as follows: We have learned, and tend to try to avoid, making mistakes. By trying to avoid mistakes we try to avoid rejection, shame and negative consequences for our self esteem. 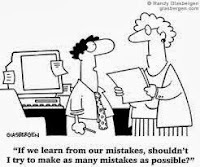 But this focus on avoiding mistakes can lead to paralysis and keep us from learning and growing. Therefore, so goes the argument, we must embrace making mistakes. Mistakes are necessary and good! We must make mistakes! My thoughts: let's not start viewing mistakes as goals or start glorifying them too much. Sure, making mistakes is part of learning and noticing and acknowledging mistakes is, in many cases, a prerequisite for learning (see the many articles about the growth mindset and deliberate practice on this site). But let's not forget that making mistakes will always remain, to some extent, aversive, and let's realize that that is a good thing. Making mistakes is inevitable in learning but the wish to eliminate mistakes and to try to prevent future mistakes is also an important element of growth and learning. I think you truly learn from your successes, not your mistakes, because mistakes only teach you how NOT to do something, while successes teach you how to do it. I agree. Mistakes have an important role in learning, I think, in the sense that they alert you to where improvement should happen/ where learning should happen but only when you have replaced mistakes by success has learning itself taken place.